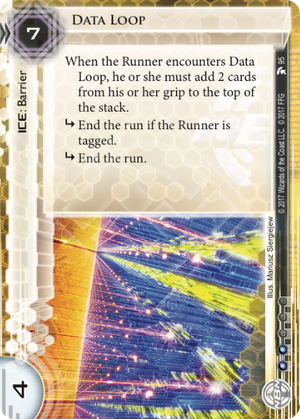 If the Runner only has 1 card in their grip when they encounter Data Loop, do they have to put that card on top of the stack? Yes. As the effect does not stipulate "if able", as much of the effect as can be resolved must be resolved. Data Loop is quite a good card. On encounter effects always add a nice little bonus to a piece of ICE. And there are now quite a few ICE with these effects. This, though, may be the best one yet. Forcing the runner to return two cards from their grip to their stack is quite a nice effect. You are setting them back a or two as they will have to redraw their cards. But more importantly, they now have a smaller hand, mid run. Use Data Loop to protect agendas such as Fetal AI and Obokata Protocol, especially in PE. Combine those or other agendas with upgrades like Ben Musashi, Prisec and K. P. Lynn. Then there are traps. Perhaps you are at game point and so the runner feels compelled to check every card you put in your scoring remote. They feel comfortable checking that un-advanced card with the four cards they have in their grip. But after hitting the Data Loop, they suddenly have to seriously worry about a Snare! Especially since they don't have enough clicks now to draw back up and try again. Seven to rez is on the expensive side, but so very worth it in any kill deck (any deck really as long as you have the money). With four strength and two subroutines, this will cost Paperclip only 3 to break, not great, but not horrible (because of the odd combination of subroutines, Corroder can actually break this for 3 as well, if the runner is untagged). Two influence means you can easily import all three into Weyland or Jinteki if you feel so inclined. Stack two or three on a server for maximum fun! So I've said it before and I'll say it again. Hunting Grounds is a good card. Try to make room for it, especially if you are relying on an A.I.